Atomic Age has a very interesting theme. Rival has managed to capture the look and feel from the mid 50’s US atomic race against the Russians. The typical 50’s design of the symbols in this slot is great. You will see a lot of milkshakes, record players and Cadillac’s. Atomic Age has 5 reels and 15 pay lines. There are two different scatter bonuses that are triggered by hitting three or more of the different trigger symbols. 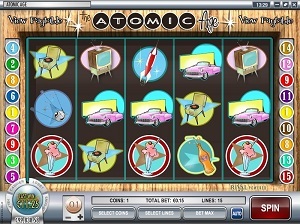 Atomic Age by Rival has a very special feel to it and they have managed to deliver a great theme with this slot machine. The graphic design of this slot is great. The symbols and game window is set in a 50’s diner. You can see all the hip designs of that specific era in the Atomic Age slot machine. The sound is mumbling of the diner guest. Each reel win has a little beep attached to it that varies from one winning combination to another. The overall impression of Atomic Age is very much in consistency with its theme. All symbols in this slot are themed related which is great considering that Atomic Age has a very unusual theme for a slot machine. All the iconic symbols that made the American 50’s design unique are apparent in this slot. You will spin the reels and see milkshakes, tv sets, soda pops, space rockets and cars. The wild is the flying saucer and it will substitute for all other symbols except for the two scatter symbols. The first scatter symbol is the Cash Register and if you hit three or more of this symbol, you will activate the cash register bonus. The other scatter is the Drive In scatter which looks like a pink Cadillac. This symbol will trigger the Drive In bonus round. There are no card deck symbols in this slot machine. The Cash Register bonus round will be triggered by hitting three or more cash register symbols. Once you have done this, you will be taken to a new game window where you have to pick items from behind the counter of the diner. The items are then added up and the total is added to your coin balance. The Drive In bonus round is triggered if you manage to hit the reels with three or more Drive In scatters. As soon as the bonus round is activated, all you have to do is to follow the instructions and make click on the objects. In this feature, you start by choosing your character, male or female, and then you choose your date. The next step is to pick the movie that will be shown in the Drive In cinema. If you pick the right one, you’ll get awarded coins that will be added to your gaming balance. Atomic Age is has 5 reels and only 15 pay lines. The minimum bet per line is 0.01 coins and the maximum is 0.25 coins per line. Atomic Age has an Autoplay function which is easily activated by clicking on the Auto button in the lower part of the game window.